In January 2011, Mrs Rosie Barnes, former CEO, CF Trust became CHI’s Patron; but she wanted a more active role than that of a typical patron. The project had slowed after visits in 2008, and other commitments had prevented Rod Halls from taking up an invitation to attend an annual CF conference in Birstonas, west of Vilnius, on 7th May. Rosie agreed to go to Birstonas, briefed by Rod and accompanied by Tony Wolstenholme, Chairman of Trustees. It was agreed that Rosie would make a presentation at the conference on the subject How families can help in the improvement of CF Care. So we made a short 2 night visit in May. We were met at Vilnius Airport by Dr Violeta Radziuniene and she acted as our driver to and from Birstonas. 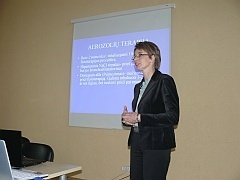 Dr Iveta Skurvydiene, a Paediatric Pulmonologist at Taurage Hospital, Vilnius was our interpreter. She had prior sighting of Rosie’s presentation. 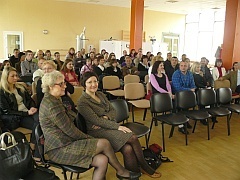 This was the third annual conference of the Lithuanian CF Parents Association. It was attended by about 50 parents and 10 medical professionals involved in CF care. The conference programme is an appendix to this report. Note that copies of their PowerPoint presentations in Lithuanian are available where they are asterisked. The first major observation to make is that, whilst we had imagined that a modest Parents’ Association was in existence, we now saw an active body, well supported by a significant proportion of those parents with CF children. We saw too, as President, Lijana: a confident leader of the Parents’ Group, ably supported by her husband, Rimantas, an IT professional. Lijana and Rimantas have 3 children: the eldest is 21, then they have a daughter of 14 with CF and a son of 4 with CF. The programme included contributions from the leading CF specialists, some commercial presentations (nutritional aids, IV devices), progress reports on the work of the Association (Lijana), the progress of the CF registry as well as Rosie’s presentation, which can be seen here. Rosie’s presentation was listened to attentively. It must have persuaded parents to be active members of their Association and been a ringing endorsement of their efforts to Lijana and Rimantas. Front: Rosie Barnes (left) with interpreter Dr Iveta Skurvydiene plus Association members. We must rely in part on what the interpreter told us. Some conversation was possible either in English or Russian, mainly in the margins. Pulmozyme and Creon are available. There is a CF healthcare plan for children but only a draft plan, published one month ago, for adults. In 2011, there are 48 adult CF patients out of a total of about 90 CF cases. Life expectancy for those with CF is now 16-18 years. The number of adult patients with CF has grown from 28% of all CF patients in 1982 to 56% in 2007. The Parents’ Association, together with Professor Dumcius, is active in trying to advance standards of CF healthcare. 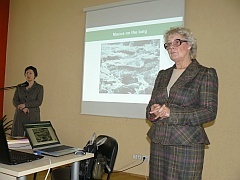 Before Christmas 2010, they presented a paper to the Lithuanian Government on “Resource requirements for CF care”. They have also lobbied in the European Parliament. The Association is working on establishing disability criteria for those with CF – to qualify for social welfare benefits. A CF registry is in course of design – the UK registry was explained by Rosie, who emphasised its value in raising standards of care and as evidence when making the case for adequate resources. Both CF medical specialists advocated CF care only at accredited centres, to which cases should be referred by GPs. Aukse Gecioniene gave a colourful and persuasive presentation on the importance of diet. She is a ‘Resident’ doctor, working in the CF Centre at Kaunas. Lijana’s working languages are Lithuanian and Russian. 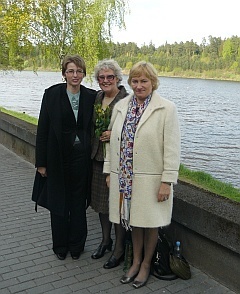 We joined Lijana, Rimantas, Violeta (CF outpatients) and Nomeda for a convivial supper, overlooking the River Nerunas. This was an informal opportunity to discuss future collaboration, explain why we had not brought some flutters as requested and to think once more about CHI’s offer of funding support to the Parents’ Association. We did sense that Lijana/ the Parents’ Association accord priority to material support – flutters, vests, medication. Lijana did comment that she would welcome secretarial support with an ability to translate and write documents in English. Left to right: Dr Violeta Radziuniene, Rosie Barnes, Dr Nomeda Jokubaitiene. We found an active Parents’Association, supportive of Lijana. Lijana appears to have satisfactory relations with the CF medical personnel but particularly cordial relations with Dr Nomeda Jokubaitiene (Deputy in Vilnius) and Violeta (Vilnius O/Ps). Most progress might be made by assuming that they will be our chief future point of contact. Nothing was said but many cases of CF are almost certainly going undetected. One way to tackle this would be the introduction of Newborn screening. It is possible that this can be achieved locally but it might be for CHI to help with this political challenge. We should ask Professor Dumcius exactly what his vision is for the future of the Lithuanian Service and what the obstacles are that prevent realisation of his vision. Lijana seems very committed to the cause of the Parents’ Association. We should encourage her to ask for any help she feels CHI can provide; CHI will have to decide how to respond. The Lithuanian Parents’ Association has good commercial sponsorship: see their website www.cistinefibroze.lt, but Lijana would probably benefit from a visit to the UK’s CF Trust, partly to see how British families are supported but also to get some ideas for fundraising. Their CF registry is not yet in operation. Its design may or may not be modelled on ECFS recommendations. Some help may be appropriate. Once complete, it will be a useful source of data to monitor CF care performance and to demand additional Government resources. Lithuania can justify one CF Centre of Excellence. Local circumstances will dictate but there is some way to go before CF patients will be cared for by a capable CF multidisciplinary team.